If you have any questions or would like to place an order, feel free to give us a call. 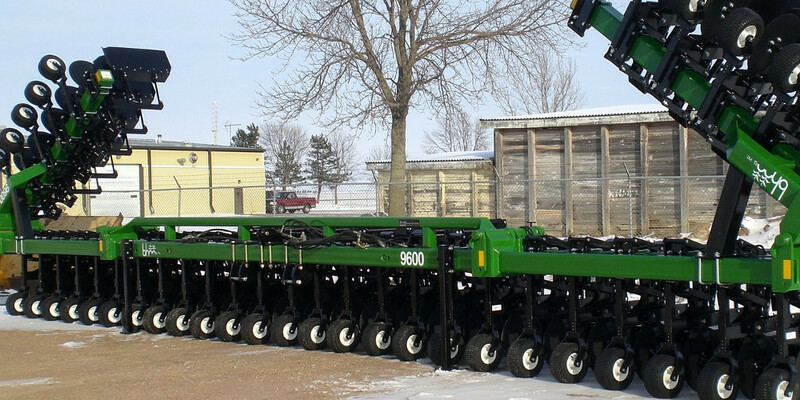 The industry-leading 36-row 9600 series cultivator. Weight: With the wrap-around parallel linkages and the short units, the 9100 allows smaller tractors to lift the cultivator without the aid of lift assist wheels; considerably easier than most of its competitors’ comparable models. Adjustments: Quick, easy adjustments to the gauge wheel and center coulter depth, and the down pressure, all with the tee handle wrench that is provided. This allows the farmer to find tune their cultivation practices in mere minutes. Wide linkage: Full length bushings extend the life of the bushings and the cultivator, maintaining the rigidity of the units. Quick-adjust cutaway disks: Clean up weeds better with precise depth and width accuracy across the machine with cutaway discs easily adjusted by hand. High-residue: Center coulter does an excellent job in cutting even the heaviest trash, allowing good flow through the cultivator. Tool bars: Heavy-duty, internally mounted cylinder allows wrap-around linkage design while allowing a 180-degree folk wing sections; narrowing the transport width of the cultivator allowing greater maneuverability. 3,000 p.s.i. tie-rod cylinders matching almost any tractor. Tall tunnel shields: Extra-long tall tunnel top shields allow better flow and increase speed while providing the maximum protection in crops of all-sizes. Rigid rear shank: Spring reset or strut design guarantee that the rear shank will not “cheat out” in hard ground. Unique pitch adjustment: Pitch on sweeps is incremented, allowing for identical and precise adjustment to increase penetration or reduce slabbing. 20" | 22" | 30" | 36" | 38" | 40"
We also make a custom dual width 30"/50" model for rows with alternating widths. 13" x 6.5" x 6" flat-proof tire is standard on all models. 18" x 6.5" x 6" flat-proof tire is available. Corn and bean-welded ridging sweeps available in both narrow and wide row widths. Corn and bean flip-down ridgers available in both narrow and wide row widths for both standard sweeps and point share-style sweep configurations. Ridgers mount in the back of the footpiece. Hitches that mount to the toolbar or a lift assist wheel are available for all models. NH3 knives that mount to the front of the standard footpiece with either one or two tubes. Low Crown 54-degree standard sweep. Replaceable point and share sweep.